It’s almost JCK time again! 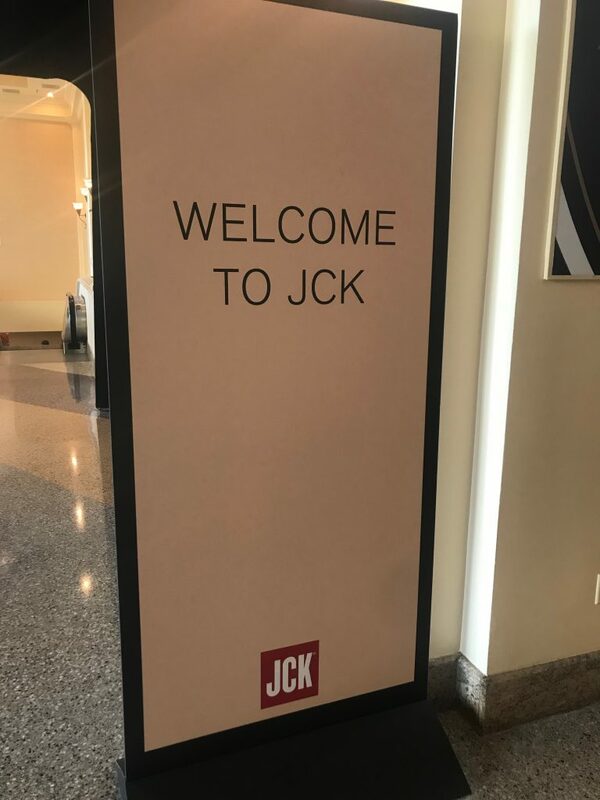 In 2018, I attended JCK in Las Vegas, Nevada for the first time. 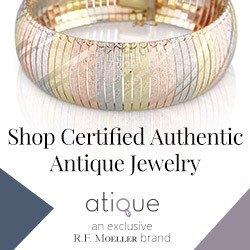 I was new to the jewelry world and had always wanted to attend. 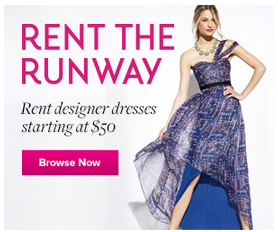 I knew it was going to be fabulous, but once I got there, I overwhelmed in the absolute best way. Oh. My. Gosh. Inside that hall, they have everything you could possibly imagine. Are you looking for a 10-carat fancy intense yellow diamond? Yep, a couple of booths had one. Maybe yellow isn’t your style, maybe you are looking for a chameleon diamond? I got to play with one of those under incandescent light too. You are a pre-screened professional, so most people will let you hold things, try them on, and sometimes even photograph them. In this article, I will share some photos of what blew me away. I am already getting so excited for this year! Before you go to the show, you will receive a large mailing box containing all kinds of information on the vendors. There will be maps of all of the different booths and all kinds of advertising. If you are going to the show looking for several things in particular, compile a list of what you will be looking for at the show. Take the time to really review the information in the box and figure out who you would like to talk with once you get there. Maximizing your time is really important because THERE IS SO MUCH TO SEE. If you are just going for inspiration, start at one side and take each booth in. 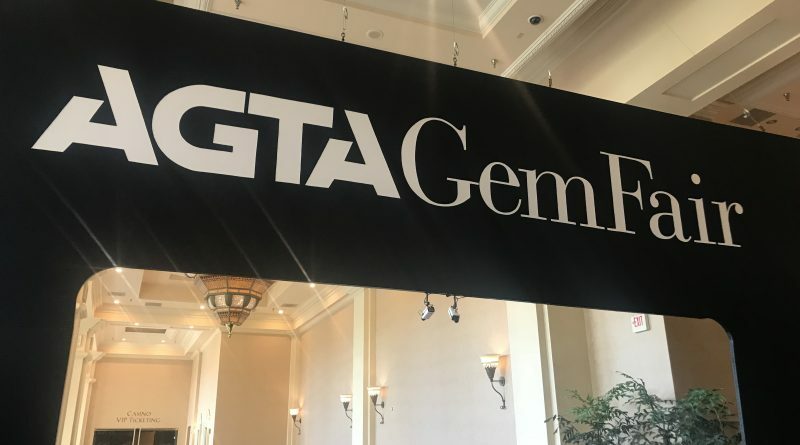 As a newbie, it was wonderful just walking from booth to booth seeing what they had to offer. There were people from many different countries in attendance, and it was fascinating to walk up to a booth, see what they were offering, and pick up snippets of conversation. I found that, in general, the vendors were so friendly and helpful. If you are social media savvy, definitely follow your favorite vendors, artists and organizations in the months and weeks leading up to the show. You will get a feel for what they are bringing to the show and where they will be located. I found that this was also a way to gauge what the hots trends would be. 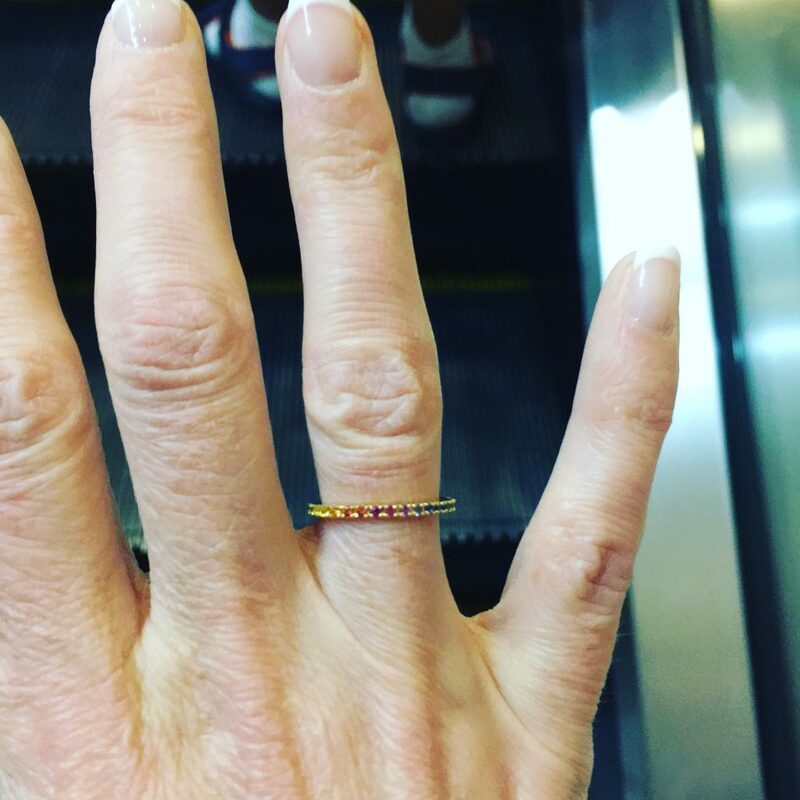 Last year, I started following Kimberley Collins Gems on Instagram, and I instantly fell in love with her small rainbow sapphire band. Not only was I quickly able to find her at AGTA, I got to meet her and bring home a new acquisition. (Rainbow goes with everything!). I also love the gorgeous jewelry that Erica Courtney, jeweler to the stars, creates, so I found her booth, got to chat with her and hold a 48.8 carat(!!) 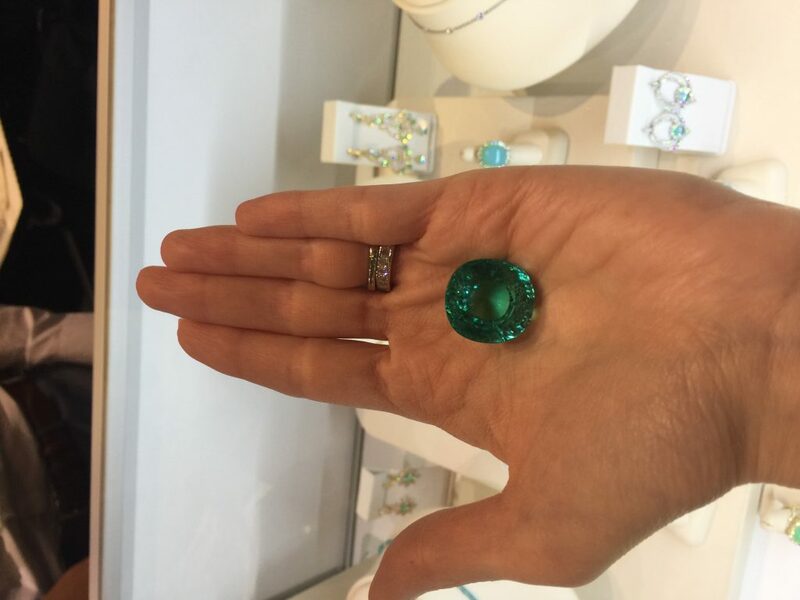 Paraiba tourmaline. One of my favorite things at the show was a giant block of ice. Why, you ask? First of all, a giant block of ice in the middle of a hotel in the desert is always interesting, but what was frozen within the ice was intriguing. The ice was part of a display set up by Greenland Ruby, and inside the ice was a piece of ruby rough. The person who got closest to the carat weight of the ruby won it. (Sadly, it was not me). 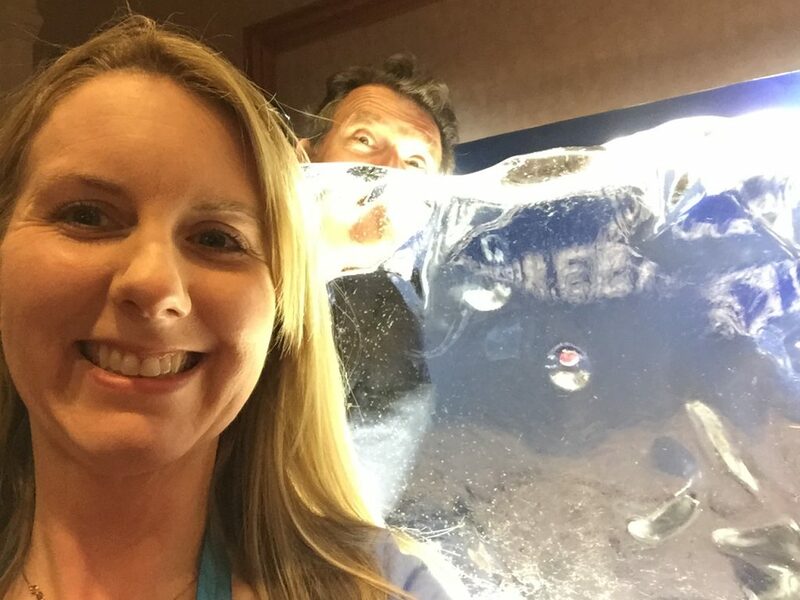 They had you take a selfie in front of the block of ice, with your best guess. I might have had a photobomber in my picture. Beware of photo bombers from Greenland! In the months leading up to the show, I’ll be posting more. If you have any questions for me, don’t hesitate to ask! JCK will be held May 31st-June 3rd at the Sands Expo and the Venetian in fabulous Las Vegas, Nevada. ← I had my Ellensburg Blue polished by a lapidary!